"AZMOL British Petrochemicals" is a petrochemical company that has been manufacturing high-quality oils, lubricants and various cutting fluids for more than 80 years. Today, the company's activities are focused on the modernization of production, product improvement and expansion of the sales market. History of development and formation of TM "AZMOL"
The beginning of the road is the distant year 1937, when a cracking plant producing gasoline for aviation was opened in Berdyansk. 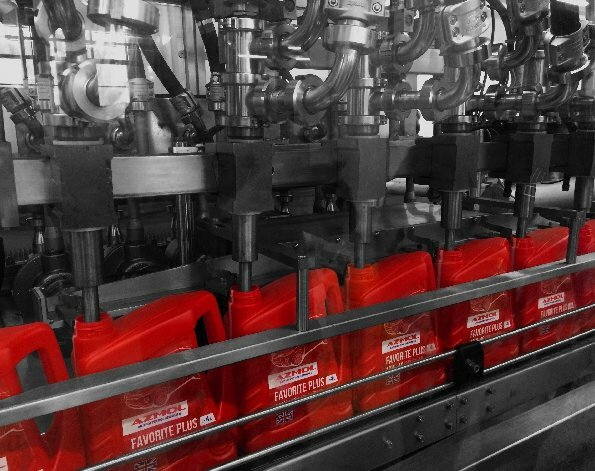 In 10 years, the company changed its profile for the production of lubricants. In this field, impressive achievements have been achieved: the plant is becoming one of the leaders in this industry in Eastern Europe. 2017 - the first deliveries of the renewed products to Uzbekistan, Iraq, Azerbaijan. A new "milestone" in the activities of LLC "JV AZMOL-BP" started with the help of investment from the British side - from the well-known company Global Lubricants Ltd. Her ancestor Terry Dicken is also the current head of the ELGI (European Lubricants Institute). The head of Global Lubricants Ltd - a recognized expert in lubricants gave the highest assessment to the quality of the products of LLC "JV AZMOL-BP". According to him, LLC "JV Azmol-BP" is a company with a long history and high level of development. "I believe that the products of the new line, which will be produced here at LLC" JV AZMOL-BP ", will become popular in the Ukrainian market and abroad," states Terry Dicken. What does AZMOL have to cooperate with the British side? In the opinion of Terry Dicken: "We bring our achievements and technologies, as well as 40 years of experience in the production and sale of oils not only in the UK, but all over the world to OOO Azmol-BP". For AZMOL British Petrochemicals - is the improvement of existing products and replenishment of the assortment with new developments of the European level. In the summer of 2017, the product of a joint Ukrainian-British development - innovative engine oil - was released. Its basis is the first-class European raw materials, which provides an opportunity to increase the productivity and durability of car engines. LLC "JV AZMOL-BP" plans to replenish the catalog of lubricants with the latest products. The main mission of LLC "JV AZMOL-BP"
The aspiration of LLC "JV AZMOL-BP" - to reach a new level and to replenish the Ukrainian and foreign markets with oils and lubricants of PREMIUM-class. The company is constantly improving, inheriting the experience of European enterprises. Priority in work - producing first-class products. Specialists of LLC "JV AZMOL-BP" work with chemical elements and base oils of high degree of purification. Clients and partners of the company as a result should receive lubricants that meet international quality standards. The products of JV AZMOL-BP LLC have already been evaluated in 10 countries, including Ukraine, Iraq, Uzbekistan, Turkey, Latvia, Estonia, Azerbaijan and others.